Etiology: Adenovirus is an enveloped DNA virus that causes respiratory disease in guinea pigs. Transmission: Adenovirus is spread by direct contact. Clinical Signs: Anorexia and dyspnea are a few of the clinical signs expressed. Tracheobronchitis is the most common disease manifestation. Animals can develop pneumonia with minimal to moderate cranioventral consolidation of the lungs. 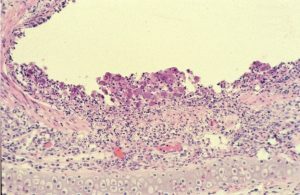 Pathology: Infection causes necrotizing bronchiolitis with desquamation of the epithelium. Basophilic intranuclear inclusions are present in desquamated or intact cells. There are pyogranulomatous peribronchiolar and perivascular infiltrates. Diagnosis: Diagnosis is made by histopathologic identification of inclusions and serology (MFI, IFA) using guinea pig adenoviral antigens.